Born in Atlanta, Georgia, on January 12, 1942 as the middle of three boys, Charles Campbell grew up on a small cattle farm outside Jackson, Georgia, where he attended the public schools. While a student at the University of Georgia in 1965, he accepted an offer to join the staff of Senator Richard B. Russell in Washington DC on one condition—that he be allowed to attend law school at night. It had been his dream since high school to be a trial lawyer. Campbell worked for Russell from January 1, 1966 until Russell’s death on January 21, 1971. In 1968, Russell appointed Campbell—then only twenty-six years of age—as his top aide. Campbell learned life-transforming lessons from Russell about integrity, hard work, and responsibility. He traveled extensively with Russell, attended his family reunions, and was one of the few people in Russell’s hospital room when he died. Campbell was involved in such events as the riots in Washington when Martin Luther King was murdered, the breach in the long-standing friendship of Russell with Lyndon Johnson and Russell’s final act as a United States senator—his proxy vote against senator Edward Kennedy that helped senator Robert Byrd defeat Kennedy for the position of assistant Democratic leader in the Senate. 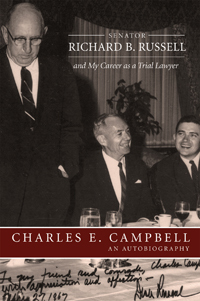 After Russell’s death, and Campbell’s receipt of his law degree, Campbell returned to Georgia and realized his boyhood dream of being a trial lawyer. He quickly realized, however, that the legal system was becoming infected with incivility, unethical and unprofessional behavior, and a mentality of winning at all costs just as he had observed in the political system in Washington. He started giving talks before bar groups on the importance of civility and professionalism. Campbell also elaborates about what we must do to repair our broken political and legal systems.